The latest in our essential Encyclopedia of Art series puts the spotlight on the catwalk to provide a practical compendium of all-media fashion design techniques. 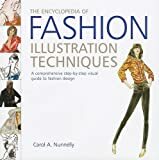 Suitable for beginners as well as experienced illustrators, this book takes readers step-by-step through precise techniques used by professionals. Learn to depict fabric textures and folds, work with color and tone to create the illusion of body forms, and transform real-life model poses into stylized figures. Containing a visual gallery of over 500 illustrations to clarify each method described, this book is an essential guide to help designers, fashion mavens, and even amateur doodlers, communicate their ideas and develop a unique graphic style.